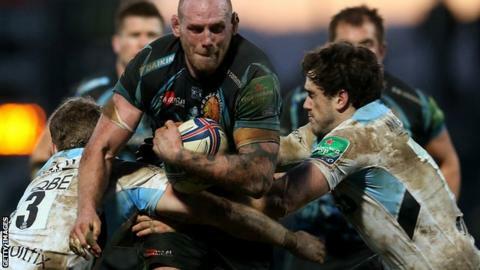 Exeter Chiefs flanker James Scaysbrook has joined the backroom staff of the Championship's bottom side Plymouth Albion on a part-time basis. The 32-year-old, who will continue to play for the Chiefs, has taken on the job of defensive coach at Brickfields. Scaysbrook featured for Exeter in Thursday's European Challenge Cup win at La Rochelle, having begun his new role at Albion earlier in the week. "Coaching is a long-term thing for me," Scaysbrook told the Chiefs website. "To go down to Plymouth is a great opportunity for me. The Championship is tough, I know that from when I played in it with Exeter, and it's the same for coaches, but I'm looking forward to the challenge." Former England Saxons representative Scaysbrook has made more than 100 appearances for Exeter since joining from Bath in 2009, but he is yet play a Premiership game this season.